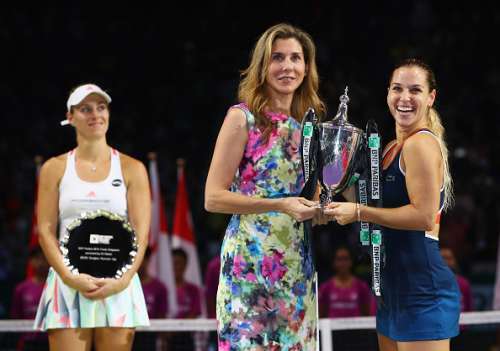 In what was perhaps the finest moment of her professional tennis career, 27-year-old Slovak Dominika Cibulkova beat World No.1 Angelique Kerber in straight sets to win the WTA Finals in Singapore yesterday. That capped off what was a spectacular season for Cibulkova, who rose to a career-best 5th place in the WTA rankings and also recorded her highest haul of titles - four - in 2016. I was lucky enough to be inside the Singapore Indoor Stadium as Cibulkova squared off against Kerber in just the second match of the tournament at the start of the week. Prior to that contest, the duo had split the eight matches they had played against each other, but the German came in as the far more confident player, having won the last four matches of the rivalry. In the build-up to the match, Cibulkova, the shortest player in the field, was asked how she would cope against the likes of Kerber, who appeared physically stronger. There was a suggestion that Cibulkova must always be at a disadvantage against the other players, given her height 5'3", 121-pound frame. But the Slovak shrugged off the question at the press conference, inciting a few giggles as she remarked that she’s used to being the shortest person wherever she goes. And her play this week sure does indicate that she's accustomed to the disadvantage by now, and has made all the necessary adjustments. Once she stepped on the court, all doubts about how she would cope with her taller opponents were dispelled. Cibulkova displayed an aggressive brand of tennis and a willingness to aim for the corners in her quest for winners, and that automatically gave her the upper hand in most of the baseline rallies. On the 24th of October, under the lights, in front of a capacity crowd, the contest between Cibulkova and Kerber turned out to be an epic. It was exactly the kind of match a tournament needs right at the beginning to get the crowd involved, invested, amazed. The crowds were glued to their seats as the duo put on a classic, with Kerber just coming out on top after a two and a half hour slugfest. Fast forward a week, and the two were at it again. Cibulkova had endeared herself to the masses after her first match in Singapore, and she had pulled off the ultimate Houdini act by reaching the semifinals despite losing two of her three round robin matches. Riding on a wave of momentum, and with revenge on her mind, the Slovak played a near-perfect match in the final, with 28 winners against just 14 unforced errors. Kerber had no answer to Cibulkova's firepower, who lifted the WTA Finals trophy in her first appearance at the tournament, becoming the first player to do so since Petra Kvitova in 2011. "I have no words, coming here for the first time, the biggest tournament of my life. I still don't know how I won, I put the ball over the net and it went in; it's the happiest moment of my life," she said right after the match. Her road to the final was anything but straightforward. After falling short against Kerber in her first match, she was nearly thrown out of contention after a straight sets loss against Madison Keys of USA. She retained a glimmer of a chance with a win over Simona Halep in her final round-robin game, but to progress further she still had to hope that Kerber defeated Keys in straight sets. Ironically, Kerber helped Cibulkova by doing just that. In retrospect, would the German be regretting that turn of events? It's tough to say. Russian Svetlana Kuznetsova awaited Cibulkova in the semi-finals. Kuznetsova had squeaked into the WTA Finals by lifting the title in Moscow the previous week, and had continued her good form in Singapore with wins against Agnieszka Radwanska and Karolina Pliskova in the round-robin stage. After having been decimated 6-1 in the first set, Cibulkova showed great composure to stay in the match by winning the second set in a tie-break. In the third, the Slovak again had to stage a comeback, clawing her way back from 2-4 down to eventually win the match and enter the final. Once she reached the summit clash, there was no stopping her offensive juggernaut. She played her best match of the tournament to outgun Kerber and walk away with the trophy and the 2 million dollar cheque. Cibulkova has been plagued with injuries throughout the course of her career, especially in 2015 – where she went missing for five months with an Achilles injury. Perhaps fittingly, even in the final, she had to suffer before she could rejoice - she squandered three match points before finally claiming victory, with the ball clipping the net before landing in Kerber’s half. The Slovak has struggled to sustain herself at the top of the women’s game; she had never broken into the top 5 before 2016, and has reached just one Major final in her career. But this win, against the world’s best, at a tournament designed specifically for the world’s best, has to give her the confidence she needs, and the belief that she belongs at the very top. All the banners in Singapore for the WTA Finals read ‘The Greatest Eight in Women’s Tennis’. But Cibulkova usurped the World No. 1 to walk away as ‘The Greatest Amongst The Greatest Eight in Women’s Tennis’ in Singapore. And she earned it. The shortest one towered over the rest, and ended up standing the tallest. Meanwhile, in the doubles, the reunion of Sania Mirza and Martina Hingis did not go as planned as they lost to eventual champions Ekaterina Makarova and Elena Vesnina at the semi-finals stage. The duo of Makarova and Vesnina defeated Bethanie Mattek-Sands and Lucie Safarova in the final, capping a fabulous year in which they also picked up gold for Russia at the Rio Olympics. Despite the semifinal defeat though, Mirza ended the year ranked World No. 1 in doubles for the second straight year.